On 27 February 1977, Argentina beat Hungary 5-1 in a friendly that marked the international debut of 16-year old Diego Maradona. At the time, Hungary had been the more successful team, with two World Cup finals (1938 and 1954), three Olympic gold medals (1952, 1964, 1968) and one silver medal (1972). But they were in decline, failing to qualify for the 1974 World Cup, the 1976 Olympics, or the 1976 European Championship. Argentina, meanwhile, had reached the Olympic final in 1928 and the World Cup final in 1930, but had since done little on the global stage (they did have 12 Copa América trophies, however). For the friendly, they met at the Bombanera in Buenos Aires, where approximately 60,000 people turned out to watch. By half time, the hosts were up 4-0 with a hat-trick from Daniel Bertoni (11′, 18′) and a goal from Leopoldo Luque (37′). Luque added another just after the break (47′) to extend the lead to 5-0 before Hungary substitute Zombori Sándor pulled one back in the 61st minute. One minute later, Argentina made a couple of substitutions of their own, taking Ricardo Villa off for Jorge Benítez and replacing Luque with young Argentinos Juniors midfielder Diego Maradona. It was Maradona’s first appearance for Argentina and he would go on to become the country’s greatest player, earning a total of 91 caps and leading them them to World Cup glory in 1986. On 9 January 2007, Liverpool and Arsenal played a 9-goal thriller in the Carling Cup 5th Round, including a missed penalty. The quarterfinal meeting paired the Premier League’s third- and fourth-place teams, with hosts Liverpool sitting one point higher than Arsenal. But the Gunners were confident having beaten Liverpool 1-3 at Anfield in the FA Cup the previous week (they had also won 3-0 in the league back in November). It was a day to remember for Arsenal striker Julio Baptista, who–after several years of rumors linking him to the club–had finally joined the Londoners at the start of the season on loan from Real Madrid. Despite his reputation as a prolific scorer, he started the day with only one goal to his Arsenal account. That changed in the 40th minute. After a pair of early goals from Arsenal’s Jérémie Aliadière and Liverpool’s Robbie Fowler, Baptista broke the deadlock with a 25-yard free kick. Then, after Alex Song put Arsenal ahead 3-1 with what appeared to be a handball off a corner kick in the 45th minute, Baptista quickly struck again before the break, delivering the ball to Aliadière on the wing then receiving it back to tap into an open net. He had a chance for a hat-trick early in the second half when Aliadière earned a penalty, but Liverpool keeper Jerzy Dudek parried Baptista’s shot. He eventually completed his hat-trick in the 60th minute and added a fourth in the 84th minute, while Liverpool got goals from Steven Gerrard (68′) and Sami Hyypia (80′) to finish the day at 3-6. Arsenal went on to reach the final, where they lost to Chelsea, while both Baptista and Aliadière moved away from Arsenal at the end of the season. On 5 January 1963, the longest round in FA Cup history kicked off, as severe winter weather forced postponements that stretched out into the middle of March. Britain’s coldest winter since 1740 delivered a combination of snow and ice, sending the country into what commentators called “the Big Freeze.” Consequently, all of the FA Cup matches scheduled for that Saturday were postponed except for three–two in the North West (Sunderland’s 1-4 win at Preston North End and Tranmere Rovers’ 2-2 draw with Chelsea) and one in the South West (West Brom’s 1-5 win at Plymouth). Some matches were played a few days later while others suffered repeated postponements. Birmingham City’s contest against Bury included a replay, one match that had to be abandoned, and a total of 14 postponements before Bury claimed a 2-0 victory on 7 March. In all, there were 261 postponements over the course of three weeks. The round finally ended on 11 March when Middlesbrough beat Blackburn in a replay. On 25 September 1963, English center forward Tom Finney, who had spent all 14 seasons of his professional career at Preston North End, came out of retirement for one match. For another club. One of the most dominant players of the era, Finney signed with Preston, his hometown club, shortly before the outbreak of World War II. But the suspension of football during the conflict meant that he did not make his debut for them until 1946. He was a standout for an otherwise largely unimpressive side, winning the Footballer of the Year award in 1953-54 and again in 1956-57. He stayed with them through the 1959-60 season, scoring a total of 210 goals in 473 appearances before injuries forced his retirement in 1960. 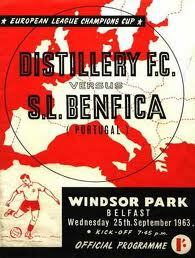 In 1963, George Eastham, the manager of defending Irish League champions Distillery FC, asked the then-41 year old Finney to play for them in a European Cup tie against Benfica, who had won the competition in 1961 and 1962. After convincing Finney that the offer was legitimate, the forward agreed to suit up for the Northern Irish club, but only for the first home leg. It was the only time in his professional career that he played an official match for a club other than Preston. On 24 September 1962, two-time European Golden Boot winner and current Rangers boss Ally McCoist was born in Bellshill, Scotland. The striker, nicknamed “Super Ally,” started his professional career in 1979 with St. Johnstone. He had a breakout season in 1980-81, scoring 22 goals in 38 league appearances, which led to a move to Sunderland. But after two unsuccessful seasons there, he returned to Scotland, signing with Rangers in 1983 for a fee of £185,000. Rangers hadn’t won the league since 1978, but with McCoist contributing 34 goals, they won it in 1987 and followed that one with nine straight between 1989 and 1997. 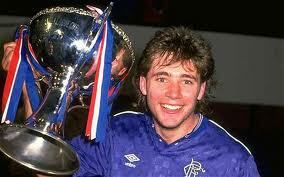 In both 1992 and 1993, McCoist matched his tally of 34 league goals, winning the European Golden Boot for both seasons. Along the way, McCoist also won nine Scottish League Cups and the 1992 Scottish Cup. While at Rangers, he made 61 appearances for Scotland, where his 19 goals rank him fifth on their list of all-time scorers. On 7 September 2010, Bahrain secured a 3-0 win over Togo. Or so they thought. The friendly, played in Bahrain, was their third match under new manager, Josef Hickersberger, who was still waiting for his first win after draws with China and Qatar. And Bahrain thought they got it in convincing fashion with a brace from striker Jaycee Okwunwanne (9′, 45′) and a penalty kick from striker Ismail Abdul-Latif (67′). Afterward, in fact, Hickersberger lamented the lack of competition from Togo, saying “They were not fit enough to play 90 minutes; the match was very boring, and basically it was not good for us because we wanted to get information about the strength of our team, especially playing with many of our professionals. This was a wasted opportunity on a FIFA date, and I’m very sad about it.” And then things got strange. Christophe Chao, the Togo sports minister, denied that any Togo team ever took the pitch against Bahrain, claiming that nobody in Togo had been informed of such a game. Moreover, none of the 18 people listed on the pre-match roster submitted to Bahrain minutes before the match was a Togo international. As it turned out, a Togo assistant coach named Tchanile Bana organized the match and falsely represented the team as Togo’s national side. He had committed a similar fraud earlier in the year by organizing a match against Egypt without the knowledge or consent of the Togolese authorities. He had received a two-year ban from all football activities after that match, which Togo extended to three years after learning of his involvement in the match against Bahrain. On 21 August 2008, the United States women won their third Olympic gold medal, beating Brazil in extra time. It was the fourth straight appearance in the gold medal match for the US, who had won it twice before, including a 2-1 extra time win over Brazil in 2004. The two teams had developed a healthy rivalry, intensified by Brazil’s 4-0 drubbing of the US in the 2007 World Cup that cost manager Greg Ryan his job. The 2008 Olympics were the first major tournament for his successor, Pia Sundhage. Played before a crowd of 51,612 at the Workers Stadium in Beijing, the final was a fluid, attacking affair that nonetheless failed to produce a goal in the first 90 minutes. The best chance of the day fell to Brazilian star Marta in the 72nd minute when she slipped through the US defense and fired from point-blank range. But goalkeeper Hope Solo managed to get a hand on the ball and stopped the shot. Then, in the 96th minute, a charging Carli Lloyd (pictured) passed the ball to Amy Rodriguez, who quickly returned the ball. Lloyd drove a shot in from just outside the box, crossing the face of the goal and beating Brazil’s keeper, Barbara. Brazil pressed hard for an equalizer, with both Marta and Cristiane creating chances, but the US defense held firm to preserve the 1-0 victory.